White Pampas Grass, originally uploaded by DianthusMoon. We are in our 6th day of a heatwave-murder! I was out setting up a hose and sprinkle for the garden that Sean purchased yesterday. It’s one of those little round sprinkers and I had to move it around and get a little wet, but in 97 degree heat it was worth it. 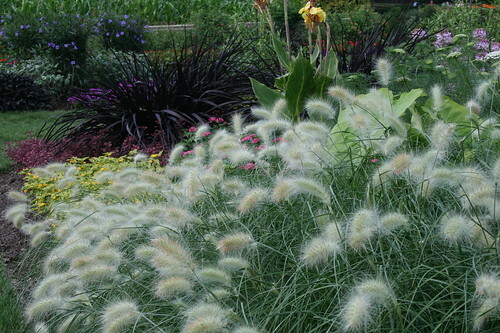 I thought I’d share this photo of something that looks like it would blow nicely in the breeze…ornamental grass. Not sure if consigning is right for me as out of 28 items, only 4 have sold so far. And I was peeved as some of my things are missing and the lady shrugged that off. I really like browsing around and finding some treasures, but when they aren’t watching their clientele that closely, that’s if they are stealing the Phillies t-shirt we couldn’t find along with a few books and a little shelf. I have an appointment for next week-think I’ll just wait until August now to pick up the things that didn’t sell. This time of year people are spending money on vacations, not used stuff. Guess I’ll keep myself busy around the house. Wish I could send you some of our cool summer weather, Dianne! We’ve had only a couple of days over 90 and many in the low 80s. Not complaining! 😀 Right now it’s 78^ so guess I should enjoy dinner on the patio before it chills off. Have a nice weekend and stay cool!